I received a Buggaloop game to facilitate this post. All opinions are 100% mine alone. See my disclosure policy. Our family’s been putting an emphasis on quality time together lately. Not that we didn’t have family time before, but we wanted to make it MORE often, and MORE quality. Board games and such have been great, since we not only have a good time together, but we can laugh and discuss together. 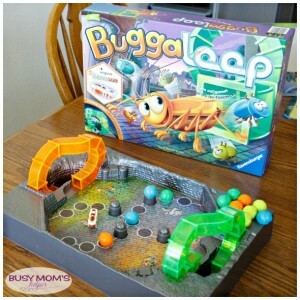 We were thrilled to try out the new Buggaloop game – it’s a great family game for all ages, especially if your kids like Hexbugs! It was a blast – the kids trying to get their bugs on the ‘safe spots’ as they made their way to the other side. The Hexbug would come out and they’d squeel and yell ‘freeze’, then try to ‘convince’ the Hexbug to not bump their color out of the circles. So cute! The multiple path options did confuse my youngest a bit – as he’d try to loop backwards, but with a little help from us he did just great. I think the bug pieces are just the right size for the kids, easy to move and perfect for that mischievous Hexbug to bump around. I do advise not rolling the dice onto the game board, as you could bump the bugs yourself – just roll it on the table. The game got SUPER exciting any time the Hexbug would start climbing back out of the tubes – the kids would scream to hurry and try to fit as many turns as they could before he emerged onto the board and they had to freeze play while he wiggled around. I think it took just the right amount of time for a game of this type – about 10-15 minutes to play. The kids stayed entertained the whole time, but it didn’t drag on like some games do. And don’t forget, there’s 2 sides to the board game – a simpler one and a more complex version – so you can up the challenge for older kids and adults! We’ll definitely be playing Buggaloop plenty more!